As autumn approaches, I dream of risotto. The following recipe takes a traditional porcini mushroom risotto—which is very easy to make—and adds onions and sausage to it. When they are used as pizza toppings (one of my favorites!) the combination of onions and sausage (and sometimes mushrooms) are called a “boscaiola,” or, from the woods. Here, it makes an excellent early fall risotto. If you don’t want to add onions and sausage, you can stick to the traditional version. 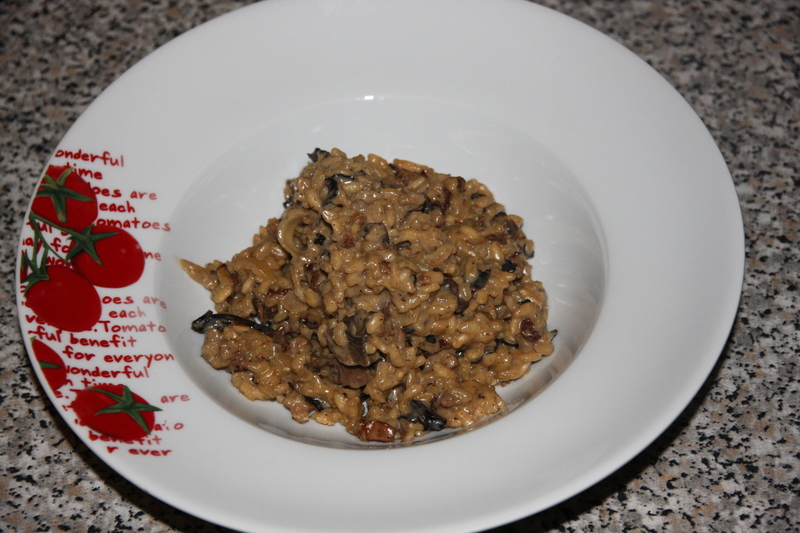 About 2 hours before you begin cooking the risotto, you must prepare the mushrooms. Melt a generous amount of butter in a saucepan over medium heat. Remove the sausage casings and crumble the sausage meat into the butter. Brown the sausage. Add the onion and rice; sauté for about 2 minutes. Along with the thyme, add the mushrooms that had been soaking in the water; squeeze excess water out into the bowl. Sauté the mushrooms along with the rice/sausage/onion mixture for about a minute or two. Reduce the flame to low and slowly add in enough white wine to cover the rice. (If you want it a little sweeter, use champagne or white vermouth). When the wine cooks out, add in enough of the liquid onion water to cover the rice. When this cooks out, add in enough of the chicken stock to cover the rice. Repeat the procedure until the rice is just about ready; then add in the cream and grated cheese. (Never waste your Parmesan rinds; you should chop them up finely and add them to soups or risottos. They take longer to melt them down, so you want to add them earlier—along with the mushroom stock or wine). When it’s ready, take the risotto off of the heat, mix in truffle oil or chopped truffles. Serve immediately. This entry was posted in food, recipe and tagged autumn, boscaiola, mushrooms, parmesan, porcini, recipe, risotto, sausage, truffles. Bookmark the permalink. This looks so goooood! Thanks for sharing…I hope I can try this someday.